These grain-free muffins are so moist and delicious, I’ve often added a dollop of whipped cream to the top and called them dessert! For a special way to say “I Love U!” check out the picture below. 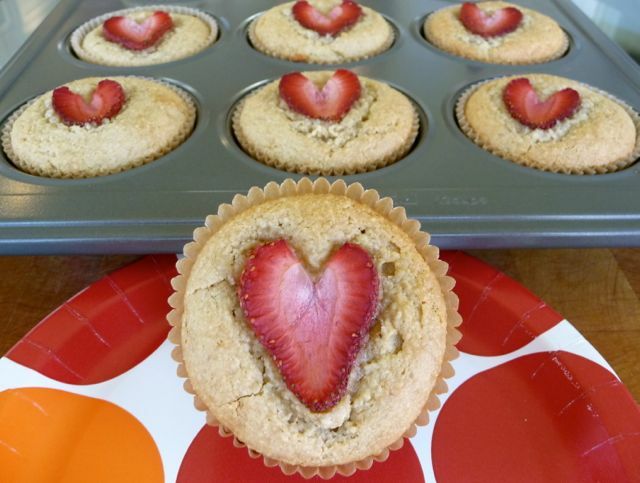 These adorable Strawberry Heart Muffins are a sweet way to show you care. Simply dice some fresh strawberries for placing in the center of the muffin, then top each muffin (prior to baking) with a fresh slice of strawberry cut in the shape of a heart as shown. Looking for a delicious dairy-free GF muffin? Then, check out the DF-GF version below. Preheat oven to 315 degrees. Place 10 paper liners in a 12-cup muffin tin; set aside. In a small bowl, add about 4-5 diced fresh strawberries and about a handful of whole fresh blueberries; set aside. In a large bowl, whisk together the eggs, yogurt, maple syrup and vanilla until well blended. Using a spoon, stir in the almond flour, salt and baking soda until well incorporated. Bake for approximately 26-30 minutes, until edges begin to turn a golden brown and a toothpick placed in the center comes out clean. Allow to cool in the pan for at least 5-10 minutes, then serve. Enjoy! *Do not substitute the maple syrup with honey or your muffins will be dry and have over-browned bottoms. **Fresh fruit works best with this recipe, as frozen fruit tends to create an excess of moisture which can make for soggy muffins. 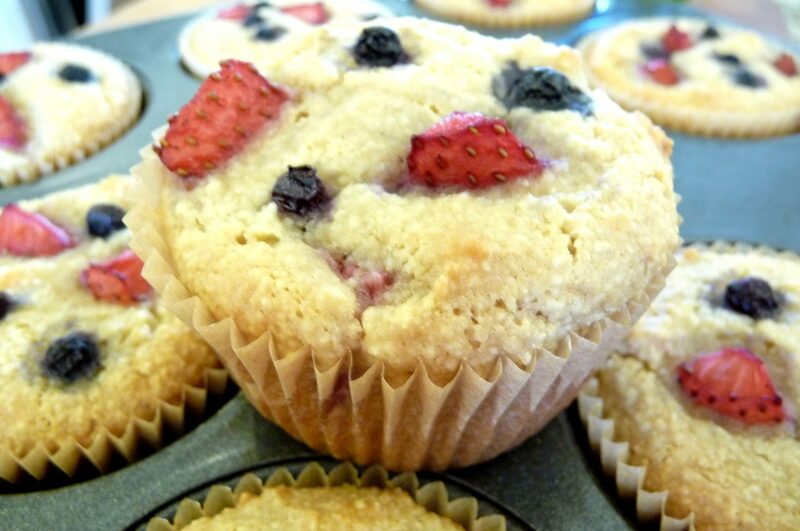 These delicious dairy-free, grain-free muffins are so easy to make – simply whip up the batter and add your favorite fresh fruit, such as strawberries, blueberries, raspberries, banana, peaches, apples – the ideas are endless! Preheat oven to 300 degrees. Line a muffin tin with 10 baking cups. In a small bowl, mix almond flour, baking soda and salt. In a large bowl, whisk melted coconut oil and honey until well combined. Then, whisk the eggs and vanilla into the coconut oil and honey mixture until well blended. Add dry ingredients to wet and whisk until well combined. Add one large spoonful of batter to prepared muffins cups. Lift muffin pan with both hands and evenly tap bottom of the pan on the counter to flatten batter. Then add a sprinkling of your favorite fresh fruit. Top with another large spoonful of batter, tap pan to flatten batter. Top with more fresh fruit. Bake 25-28 minutes, until muffins are slightly golden and a toothpick inserted comes out clean. Allow to cool five minutes in muffin pan before serving. I had to see what the heart on the muffins was when I saw the image on TIme-Warp Wife blog hop. Oh! A Strawberry! How clever…and the recipe looks great too. But I love hearts, so that’s what convinced me I should try this. : ) Thanks for sharing this recipe. Both of these recipes look amazing! ! love the strawberry hearts, such a sweet and lovely touch. We love using yogurt or kefir…makes things so moist – oh, yum! Your strawberry “hearts” are such a nice touch! I can’t wait to try these beauties…thanks for posting! Just made the Mixed Berry Muffins and they are awesome. Kids agree!!! I had some berry kefir so I decided to use it instead of plain and it worked well, I did 3 Tbsp of Maple Syrup since the Berry Kefir has sweetness to it. Used Strawberries. These are a keeper! Thank you for sharing them! Your muffins sound delicious, and I agree they would be gorgeous for dessert as well. I love how you made the strawberry hearts – what a sweet idea! It’s lovely how you have adapted the recipe for DF and GF diets as well. Thank you for sharing this wonderful post with the Hearth and Soul hop! Hi Kelly! I just wanted to say thank you for another wonderful recipe! These were so great. Both of my boys loved them and so did I. Thanks again for your hard work! You are very welcome! I shoukd’ve added that I actually used some frozen fruit also. I was worried about doing so after your warning, but they turned out great. In Ohio, it’s slim pickings with organic fruit this time of year. Thank you so much for the time you put into sharing all of these awesome nutritious recipes for others! My 9 yr. old son had an IGg test which revealed he should not have wheat, gluten, cows milk, egg yolk or bakers yeast! I feel a bit overwhelmed (even though we’ve tried to always eat a clean whole foods diet) because these were regualar items in his diet. My question is: what can I do instead of using whole eggs in these recipes? Should I use more egg whites or will it ruin the whole thing? Thanks again for your help! Hi, Myra. I would stick with what your naturopath recommends. Start with removing the 2&3 rated foods as she said for the time period she specified. If you see great improvement after 30 days, then you know that removing these foods is helping your son. If the progress is what you had hoped at the 30 day mark, then you could try something as simple as switching him back to whole eggs (reintroducing the yolk). Do not introduce any of the other foods you’ve removed for a least a week (some elimination diets recommend going as slow as only reintroducing a new food every three weeks). You’ll have to make that decision with your naturopath about how slowly she wants you to reintroduce the offending foods. The key is to only reintroduce one food at a time with an extended period of time between each food reintroduced so you will know if your son starts having trouble again that it is related to this particular food. That’s why personally, I always err on the side of the slower the reintroduction process the better, that way you give the body enough time to see if it’s going to react or not. Also, I highly recommend if you reach the 30-day mark after having removed all of the high sensitivity foods (as per your naturopath) and yet you are still not seeing the results you had hoped – in other words your son still isn’t feeling better. Then that would indicate more exploration is needed on what other issues may be a play. Perhaps this would require removal of the 1-score foods with another 30-day period. Or perhaps a deeper dig on what else may be an issue. So in other words, I would not start reintroducing any suspected problematic foods until your son is feeling better at a level you and he are comfortable with. These were super easy to put together and they are really tasty! Not too sweet – just enough from the berries. I actually forgot to add more berries to the top! I used frozen blueberries and blackberries that were thawed and drained, worked great. I’ll make these again for sure, even experimenting with other fruit. My 5 year old daughter and I made the mixed berry muffins yesterday and they are AMAZING!!!! Best grain free muffins I have made hands down. My daughter said they tasted like “real” muffins and would like to eat one every day! My 8 year old son also loved them and requested one for his snack today. Your website has been a breath of fresh air for me, thank you for making my grain free life tasty! OK, I don’t know what I’m doing wrong with these muffins but the batter is super dry. Is that the way its supposed to be? ?